The upcoming animated adventure Moana will introduce fans to Disney's new princess, the title character voiced by Auli'i Cravalho. As we get closer to the November 23 release, the studio has released a clip and TV spot showing that Moana isn't your typical Disney heroine. This latest scene features title character standing her ground after first meeting the legendary Maui, voiced by Dwayne Johnson. This sneak peek, which arrives courtesy of Walt Disney Animation Studios YouTube, features Moana trying to introduce herself to Dwayne Johnson's Maui, although he keeps interrupting, correcting her with his full title. Maui mistakenly thinks that Moana just wants an autograph, which he signs using Hei Hei the Rooster (Alan Tudyk), while making a humorous social media joke. Maui finds out soon thereafter that Moana is not to be trifled with. Three thousand years ago, the greatest sailors in the world voyaged across the vast South Pacific, discovering the many islands of Oceania. But then, for a millennium, their voyages stopped - and no one today knows why. From Walt Disney Animation Studios comes Moana, a sweeping, CG-animated adventure about a spirited teenager who sails out on a daring mission to prove herself a master wayfinder and fulfill her ancestors' unfinished quest. 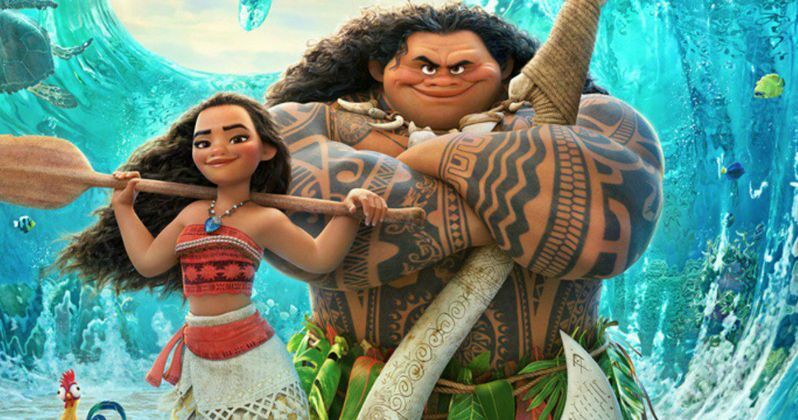 During her journey, Moana (voice of Auli'i Cravalho) meets the once-mighty demi-god Maui (voice of Dwayne Johnson), and together, they traverse the open ocean on an action-packed voyage, encountering enormous fiery creatures and impossible odds. Ron Clements and John Musker (The Little Mermaid, The Princess and the Frog, Aladdin) are directing Moana from their own screenplay, with Osnat Shurer (Oscar-nominated Pixar shorts One Man Band, Boundin) producing. The music will be composed by Tony-winner Lin-Manuel Miranda (Broadway's Hamilton, Tony-winning In the Heights), Grammy-winning composer Mark Mancina (Speed, Tarzan, The Lion King) and Opetaia Foa'i (founder and lead singer of the world music award-winning band Te Vaka). Disney will release Moana in theaters on November 23, going up against Paramount's Allied, Broad Green Pictures' Bad Santa 2 and 20th Century Fox's Rules Don't Apply. In addition to this clip, we also have a new TV spot plus a brief behind-the-scenes video featuring Alan Tudyk providing the voice of Hei Hei the Rooster. Hopefully we'll see more of these behind-the-scenes videos as we get closer to the November 23 release date. Until then, take a look at these new videos from Moana.